This week it’s breakfast menu. Yes, I am back in track with this one for my lunch/ breakfast menu series. I really really wanted to make this when my in-laws were here. But when I asked mami, she said, why you are doing two things, just keep it simple. I was skeptical if they would like this or not, so I avoided making this. In-fact, I myself have not made this combo so far – pesarattu + upma together. I very well know it’s a combo meant for each other and its also known as MLA pesarattu. I have also tasted this combo back in Chennai at ID Sathyam cinemas. And I loved it too. Rava upma is my most favourite, so is there any better reason needed for me to like it? It’s not that complicated to make it too… You can spend less time in kitchen, still make your family/ guests a special breakfast, that is filling. Here’s how I made. Soak whole green moong (paasi payaru)-1 cup overnight in a big enough vessel and enough water as it absorbs a lot of water and becomes double. Morning on wake up, grind it in mixie to keep it simple. Its lot easier than grinding in grinder. This time I ground it smoothly. Though it doesnt need any standing time, I keep it for 2 hours aside. Grate coconut for chutney – I usually grate bulk in my ultra wet grind coconut scraper attachment and store in small zip locks. Defrost and use when ever I need. Chop onions, green chillies for rava upma. Chop 2 onions for spreading over pesarattu as well. Peel required ginger for the chutney and if needed for upma too. Fry the onion slightly, meant for spreading over pesaratuu and keep a side. Season for chutney in a bowl. Roast rava (1 cup) for upma and prepare upma. Grind chutney. 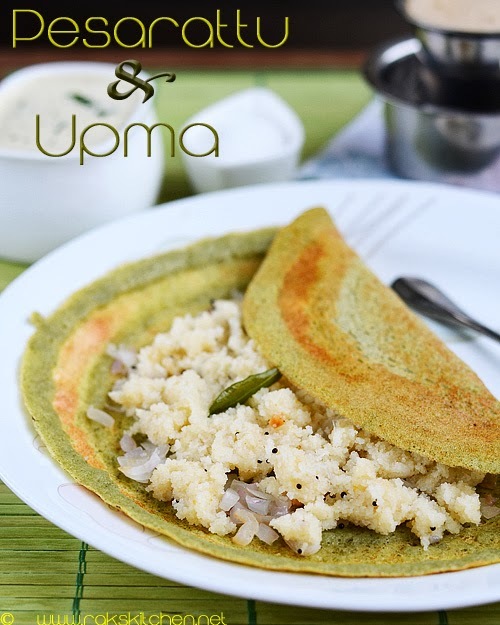 At the time of serving breakfast, make pesarattu, spread some onion, then a laddle full of upma and fold into a triange as I have done here in this dosa or just fold as we do for the usual masala dosa. Hope you all are enjoying the weekend. Lets meet with another interesting recipe! I will notice next time and update here. That's my favourite. I make Pesarattu often, but rarely alongside upma. Yours looks beautiful! Lovely pics of the upma with filter coffee. Excellent preparation. This is what I call ' A Perfect Breakfast '.. Delicious! Had this combo @ my friend's place once..nice recipe and wonderful clicks as always.. I am bookmarking this recipe, and will serve with chutney but then for lunch. Delicious! I make this often too! I made this today for breakfast Raji… Pics are perfect resolution.